Differences in preference, defined as the behavioral response of an animal to plants when a choice is given, affects not only animal utilization of forage species, but forage persistence and yield if preferred species are repeatedly grazed. Horses are known to be selective grazers, when compared to other livestock. Forage yield is an important criteria when selecting grasses for productive pastures, especially for highly selective livestock like horses. The objectives of this research were to evaluate preference and yield of cool-season perennial and annual cool-season grasses while grazed by horses. Research was conducted in 2010 through 2014 in St. Paul, Minnesota. Four adult stock-type horses rotationally grazed two separate experiments. Cool-season perennial grasses were planted in replicated monocultures and grazed each month during the growing season (April through October). Cool-season perennial grasses inlcuded tall fescue, meadow fescue, quackgrass, smooth bromegrass, meadow bromegrass, reed canarygrass, perennial ryegrass, timothy, Kentucky bluegrass, creeping foxtail, and orchardgrass. Cool-season annual grasses were planted each spring and fall in replicated monocultures and grazed in May and June (spring planting) and September and October (fall planting). Cool-season annual grases included winter wheat, annual ryegrass, spring barley, spring wheat, and spring oat. Prior to grazing, grasses were measured for yield. Immediately after grazing, horse preference was determined by visually assessing percentage of forage removal on a scale of 0 (no grazing activity) to 100 (100% of vegetation grazed). Following grazing, manure was removed, and remaining forage was mowed to 3 inches and allowed to re-grow. Plots were hand-weeded, fertilized according to soil analysis and irrigated if necessary. Figures 1 and 2. Kentucky bluegrass, timothy (photos 1 and 2) Left: pre-grazed timothy and right: post-grazed timothy), and meadow fescue were the most preferred perennial cool-season grasses with most grazing events removing > 60% of the forage, while meadow bromegrass, creeping foxtail, reed canarygrass, and orchardgrass were less preferred, with removals of < 50% of the forage (P ≤ 0.0027). Kentucky bluegrass, timothy (Figures 1 and 2), and meadow fescue were the most preferred perennial cool-season grasses with most grazing events removing > 60% of the forage, while meadow bromegrass, creeping foxtail, reed canarygrass, and orchardgrass were less preferred, with removals of < 50% of the forage (P ≤ 0.0027). 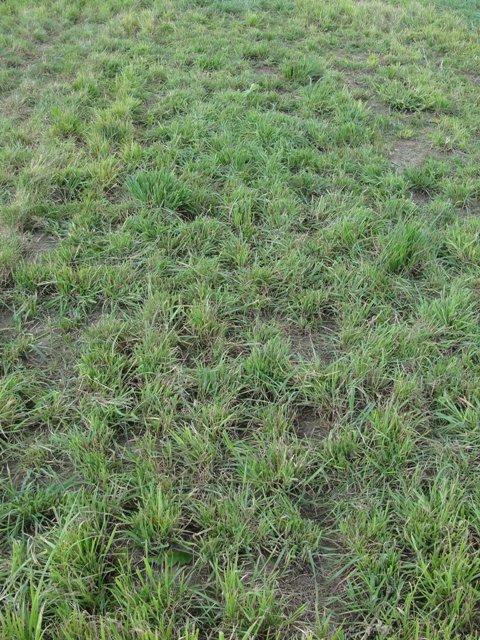 Quackgrass, tall fescue, perennial ryegrass, and smooth bromegrass were moderately preferred by horses. 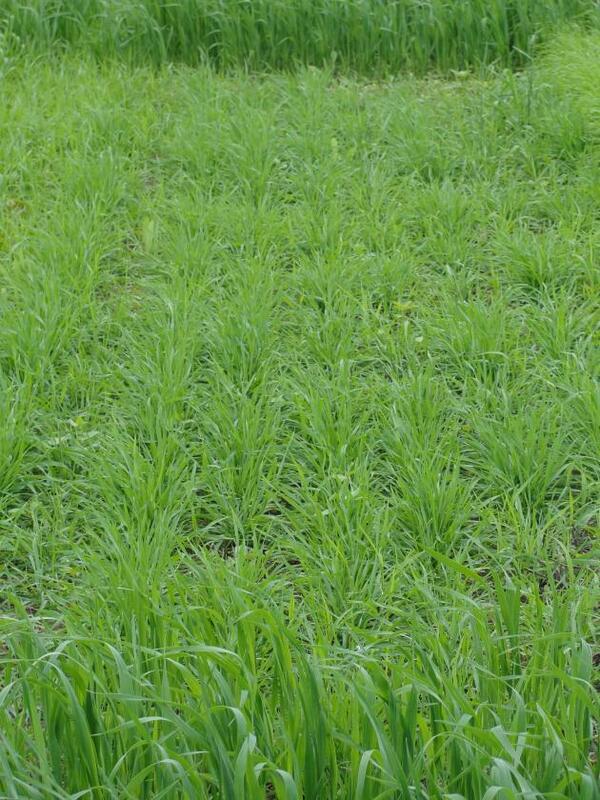 Orchardgrass produced the highest yield with ≥10.1 t/ha, while creeping foxtail, smooth bromegrass, and timothy produced the lowest yield with ≤ 8.7 t/ha (P = 0.0001). 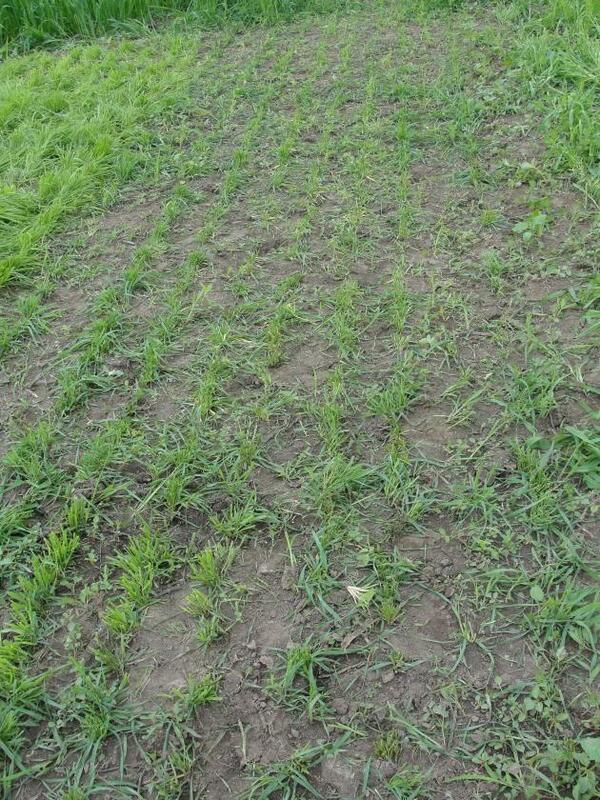 Quackgrass, perennial ryegrass, reed canarygrass and meadow bromegrass yielded moderately well. Figures 3 and 4. Winter wheat (photos 3 and 4) Left: pre-grazed winter wheat and right: post-grazed winter wheat) was the most preferred annual cool-season grass with a removal of 93%, while oat was least preferred with a removal of 22% (P < 0.001). Winter wheat (Figures 3 and 4) was the most preferred annual cool-season grass with a removal of 93%, while oat was least preferred with a removal of 22% (P < 0.001). Oat and spring wheat yielded the highest with ≥ 3.91 t/ha while winter wheat yielded the least at 1.91 t/ha (P < 0.001). This information will aid owners and professionals when choosing pasture species that maximize horse preference and forage yield. Future equine grazing research should focus on evaluating horse preference and yield of cool-season grass mixtures. Research should also focus on evaluating horse preference and yield of alternative forages. Allen, E., C. Sheaffer, K. Martinson. 2013. 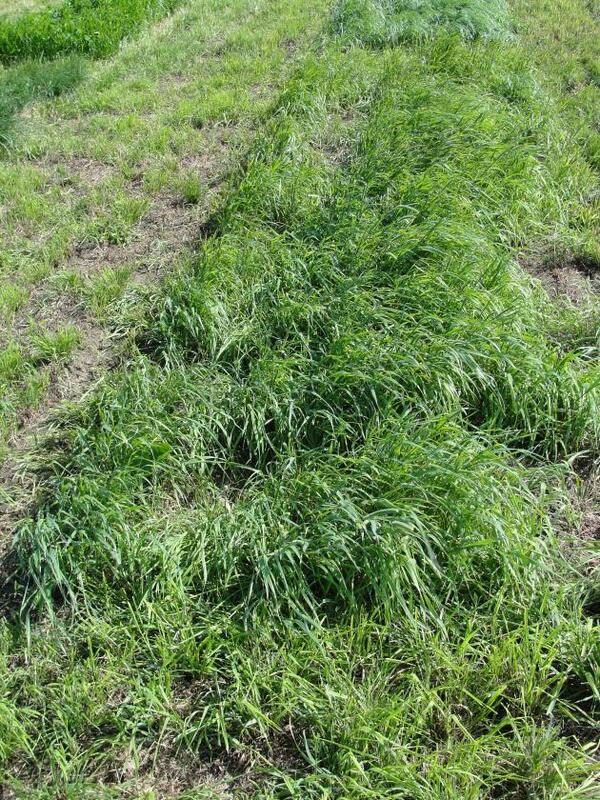 Forage Nutritive Value and Preference of Cool-Season Grasses Under Horse Grazing. Agronomy Journal. 105: 679-684. Allen, E., C. Sheaffer, K. Martinson. 2012. Yield and Persistence of Cool-Season Grasses Under Horse Grazing. Agronomy Journal. 104: 1741–1746. Grev, A.M., K.L. Martinson, and C.C. Sheaffer. 2014. Yield, forage nutritive value, and preferences of spring planted annual grasses under horse grazing. Journal of Animal Science. 92; pg. 34.